Duke Ellington was one of the greatest composers of the 20th century. He wrote wonderful, popular, music and songs, extended jazz works, suites as well as sacred music. Versatility was what the Duke was all about – he was the Renaissance man of jazz. Duke Ellington is acknowledged as the greatest composer in jazz and his innovative arrangements featured his piano playing against a rich, deep sound played by the brilliant musicians of his orchestra. Over five hundred of the best jazz players in the world passed through his ranks; rarely was anyone fired because he only hired the best. Edward Kennedy Ellington’s father was a butler in a house close to the White House in Washington D.C; he wanted his son to become an artist. He began studying piano when he was seven or eight, learning to read music soon after, which helped him to achieve greatness later on. As a teenager he was described as being somewhat detached, maybe even a little haughty, it was as a result that became known as ‘Duke’. He made his professional debut in 1916 having learned ragtime piano from a pianist named Doc Perry; even before he made his debut, he had composed his first rag. He played in the capitol’s nightspots with a group that included drummer Sonny Greer, who worked with Duke for many years. In 1922 he took his trio to New York City to work, but it was a failure. Encouraged to return a year later by Fats Waller, he took his Washingtonians to work in Harlem; a few months later they were uptown at the Kentucky Club on Broadway. Soon the Duke was working up more complicated arrangements as well as experimenting with his own material. Success meant Duke needed a manager. Irving Mills, a music publisher and all around man about music proved to be the right choice when he secured a gig at the prestigious Cotton Club. When Duke’s band opened it was a ten-piece having been joined by clarinetist Barney Bigard, along with saxophonists, Johnny Hodges on alto and Harry Carney on baritone. Pivotal to Duke’s success were his radio broadcasts from the Cotton Club, which carried his name directly into homes all across America. As the 1920s came to an end, Ellington’s orchestra were not just known at home; word had spread to Europe and Britain. In June 1931, Ellington was in a studio in Camden, New Jersey to record one of his most ambitious records – ‘Creole Rhapsody’. It took up both sides of a 78-rpm record, something completely new for a jazz band; this is what classical orchestras did. Ellington eventually left the Cotton Club to appear in concert nationally, before in 1933 embarking upon his most ambitious tour, crossing the Atlantic to perform in Britain. He appeared at the London Palladium for the first time on 12 June 1933 and was afforded a “wildly enthusiatic welcome.” Among those in the audience was Nesuhi Ertegun along with his younger brother, Ahmet to witness “the King of Jazz” as the newspapers dubbed the Duke; Ahmet would later co-found Atlantic Records. The 1930s saw some of the Duke’s biggest selling records including, ‘It Don’t Mean a Thing If it Ain’t Got That Swing’, ‘Sophisticated Lady’, ‘Stormy Weather’ and ‘Caravan’. On many of these records, as well as Ellington’s 1933 trip to London, were some outstanding musicians, including Barney Bigard on clarinet and Ben Webster on tenor sax. By the time Ellington returned to Britain in 1939, Billy Strayhorn had joined the band as arranger, composer and second pianist. He added yet more depth and variety to the Ellington sound. The tours in the USA had got bigger and more lavish and instead of traveling by bus, like most bands, ‘Duke Ellington’s Famous Orchestra’ traveled in their own Pullman car. This was not the inspiration for one of his most famous records, ‘Take The A Train’, which Duke recorded in January 1941. The song, written by Billy Strayhorn, which has become synonymous with the band, was actually about the New York subway. Take The A Train was just one of a whole string of amazing recordings made between 1939 and 1942; Duke’s orchestra was at its absolute best. 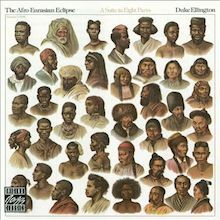 But even these were to be eclipsed by Ellington’s first really long work ­– ‘Black, Brown and Beige’ – which had its premiere at Carnegie Hall in November 1943. The inspiration behind the piece was to tell the story of African-Americans and their struggle. It was the first in a series of concerts, which showcased Ellington's longer works. With the strictures of war, followed by the decline in interest in big bands, Ellington’s Orchestra, like eery other big band, suffered, but with the financial backing of his publishing royalties, Duke was able to hold things together better than most. By the early 1950s he lost two of his stalwarts – Johnny Hodges and Sonny Greer, it seemed that the Duke might actually fold his touring band. However, the advent of the long-playing record allowed Duke to focus his composing efforts on increasingly interesting pieces. o in Blue’, a piece dating from the late Thirties, the Ellington Orchestra took the festival by storm. They were helped too by the return to the fold of Johnny Hodges and the two old stalwarts recorded some wonderful albums for Verve. In the early Sixties Ellington also worked with some younger jazz stars, including, Charles Mingus and John Coltrane, which helped to introduce him to a new generation of fans. 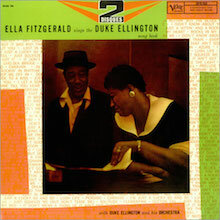 But it wasn’t just the new breed that was acknowledging the Duke; Ella Fitzgerald recorded her songbook tribute to Ellington for Verve – it was a master class. In 1965 he recorded his first concert of sacred music, which met with mixed reviews; a fact that did nothing to deter the Duke from reprising it all over the world on numerous occasions. At the other end of the musical spectrum, he did the music for ‘Assault on A Queen’, a Frank Sinatra film; the music was much better than the movie. The following year the Ellington Orchestra worked on an album with Sinatra called ‘Francis A and Edward K’. This unique collaboration for Reprise Records went almost unnoticed at the time of its release, failing to even make the Top 40 album chart; it was THE voice alongside one of THE great jazz orchestras. In 1969 Ellington received the Medal of Freedom at the White House as well as working all around the world. This included a tour of Russia in 1971 and a concert in Westminster Abbey in London of his sacred music in December 1973. Duke was suffering from lung cancer, having made his final studio album a few months earlier in a recording career that lasted 49 years, and he died on 25 May 1974. For this classic encounter, Duke Ellington "sat in" with the John Coltrane Quartet for a set dominated by Ellington's songs; some performances have his usual sidemen (bassist Aaron Bell and drummer Sam Woodyard) replacing Jimmy Garrison and Elvin Jones in the group. Although it would have been preferable to hear Coltrane play in the Duke Ellington orchestra instead of the other way around, the results are quite rewarding. Their version of "In a Sentimental Mood" is a high point, and such numbers as "Take the Coltrane," "Big Nick," and "My Little Brown Book" are quite memorable. Ellington always recognized talent, and Coltrane seemed quite happy to be recording with a fellow genius. Only one famous "hit" on this compilation -- a lovely "Sophisticated Lady" from 1970 featuring the marvelous Harry Carney on baritone sax. The rest of the collection is a delightful mixed bag of short pieces recorded from '69 to '71, and a discographically unique extended 20 minute suite from 1959. Standouts among the short tunes are a two of Duke's rock-and-roll-riff-and-blow tunes, "Bateau" and "Mendoza." 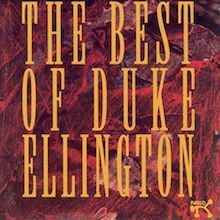 I love Duke Ellington's rock-and-roll music, sounding like oddball 1960s party music movie soundtracks, with slightly dissonant bluesy riffs, excellent solos from his unparalleled band of virtuoso improvisers, and great rocking drums from the terrific Rufus "Speedy" Jones. 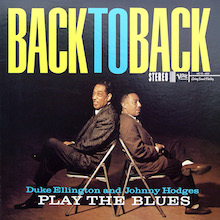 The other short tracks feature Johnny Hodges and other great soloists in 3 of Duke's almost-always excellent vignettes. Excellent throughout, on this record. The album's extended piece, "The Queen's Suite," was originally recorded and privately cut onto one single LP by the Duke at his own expense, as a gift to Queen Elizabeth of England for her private enjoyment in 1959. Written by Ellington and Strayhorn, the suite of six short pieces is highlighted by two additions to the Ellington Orchestra's canon of gorgeous "sweet" tunes in slow tempo & dreamy timbre, "Sunset and the Mocking Bird," and "The Single Petal of a Rose." A unique and evocative, almost fairy-tale-like story in the annals of discography, imagining the Duke presenting a Queen with a personal record for her ears only recalls the era of chivalry. A noble gift from a Duke to a Queen. Nobody else would have done it. And the music is beautiful. I would give any Duke record a presumptive 5 stars until proven otherwise, but the Pablo Best Of is the only one I thoroughly vouch for. Ella Fitzgerald's outstanding songbook series has become an institution unto itself. This 1957 effort is distinguished from Fitzgerald's other songbooks in that it is the only album in which the composer whose work she is singing actively participates. In fact, these recordings are packed with some of the key figures in 20th century jazz. As if Ella and Duke weren't enough, Ellington's arranger/composer Billy Strayhorn, guest musicians Dizzy Gillespie and Oscar Peterson, and brilliant record producer Norman Granz all have a hand in the proceedings. And what better backing band could one want than Duke's orchestra? The usual suspects -- Jimmy Hamilton, Johnny Hodges, Paul Gonsalves, Harry Carney, and Sam Woodyard, among others -- contribute fine performances throughout. 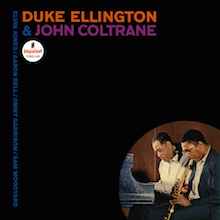 Duke's spectacular catalog dazzles, and his sprightly, lush textures are transfigured under Fitzgerald's warm-timbred voice and elegant, precise delivery. Included here are classics like "Rockin' in Rhythm," "Caravan," "Satin Doll," "Sophisticated Lady," "Prelude to a Kiss," and "It Don't Mean a Thing...," each tune as familiar as it is delightful to hear in this new context. These distinctive small-group sessions, featuring Duke Ellington as pianist in a blues context, are part of a group of recordings issued under the confusing titles Back to Back and Side by Side, and further reissued under the not particularly distinctive name of Blues Summit. But there should be no confusion about the high quality of music that came out of these sessions -- it is all "cooking with gas" as the expression goes. From the jazz world, it would be difficult to find more profound soloists on traditional blues numbers than the Duke or his longtime collaborator Johnny Hodges, who does some of the most soulful playing of his career here. Also hitting a very high standard for himself is trumpeter Harry Edison and, while musicians are being patted on the back, the Jones boys in the rhythm section should be given a hand. That's Jo Jones (drums) and Sam Jones (bass), so as not to create additional confusion in the Jones-heavy jazz world. The songs all have titles that end in "Blues," with the oddball having "Love" in the title not once but twice. (It's "Loveless Love," what else?) But these songs are just vehicles for playing the blues, a formula that has produced great music many times, and certainly did every time this particular pianist was leading the group. 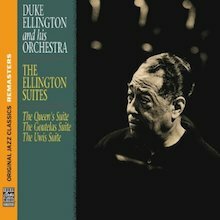 The three Ellington Suites in this release were recorded at different times along Ellington's legendary and prolific arc: The Queen's Suite in February and April 1959 (written for and dedicated to Queen Elizabeth II, but not widely released until 1970); the Goutelas Suite in April 1971; and the Uwis Suite in October 1972. "Ellington would record his orchestra at his own expense, and then stockpile the recordings," says Nick Phillips, Vice President, Catalog and Jazz A&R at Concord and producer of the Original Jazz Classics Remasters series. "These were recordings that were later sold to Norman Granz, who had the good sense in the '70s to collect these then-unreleased suites on one album." Nearly 40 years after its first release, "this latest edition of The Ellington Suites adds a studio discovery: the never-before-released ‘The Kiss' is a track recorded in 1972 at the same session that yielded the Uwis Suite," says Ashley Kahn, author of the new liner notes for the reissue. "[It] is included herein as a reminder of how - all the way to the end of his timeline - Ellington was at work at new creations, ever intrepid and ever expansive. Today The Ellington Suites, music he produced to his specifications and at his expense, are as powerful a statement as any to the remarkable consistency that colored the entire, storied career." 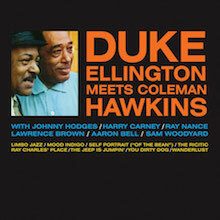 This CD reissue brings back one of Duke Ellington's most intriguing works from his later years. "Acht O'Clock Rock" actually shows the influence of rock while some of the other selections hint at both African folk music and more advanced areas of jazz. However the familiar Ellington sound was still very much intact in 1971. The main soloists include Harold Ashby and Paul Gonsalves on tenors, baritonist Harry Carney (featured on "Didjeridoo") and altoist Norris Turney; the versatility of drummer Rufus Jones really helps the colorful music. Topping off a wealth of full-band recordings, the various stars of Ellington's great outfit recorded many combo sides under their own names. And while not on the same sophisticated level of classic Ellingtonia, the late-'30s material cut by Johnny Hodges, Cootie Williams, and Rex Stewart is packed with tasty solo work and some of the finest examples of early small-group swing. 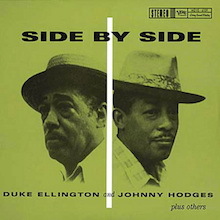 These later examples from 1958-1959 feature Hodges backed by both Ellington and Billy Strayhorn on piano and such non-Duke luminaries as Ben Webster, Roy Eldridge, Harry "Sweets" Edison, and Jo Jones. Like its companion album, Back to Back, Side by Side has a loose, jam session feel, with all the soloists stretching out. Hodges is in top form throughout, while Edison and Webster man their spots just fine. Highlights include the sveltely swinging "Going Up" and Hodges' bluesy closer, "You Need to Rock." A must for fans of vintage combo swing. 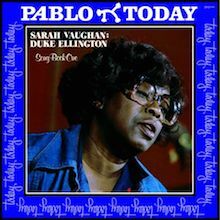 Sarah Vaughan interprets ten Duke Ellington-associated songs on the first of two sets; Songbook, Vol. 2 was recorded at the same two sessions as this CD reissue. Vaughan is accompanied by a variety of jazz all-stars, including trumpeter Waymon Reed, trombonist J.J. Johnson, and the tenors of Frank Foster, Frank Wess, and Zoot Sims. Bill Byers contributed the arrangements for the larger band performances. The emphasis is on ballads, with the highlights including "I'm Just a Lucky So and So," "I Didn't Know About You," "All Too Soon," and "Lush Life." Sassy's voice is in typically wondrous form throughout. 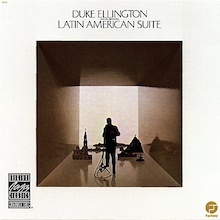 Duke Ellington always absorbed influences from the music he heard as he toured the world, and The Latin American Suite is no exception. Written during his first tour of Central and South America in 1968, Ellington premiered several of the pieces during concerts in the Southern hemisphere, though he didn't record it until returning to the U.S., with one piece ("Tina") being recorded separately over a year after the other tracks. "Oclupaca" is an exotic opener showcasing Paul Gonsalves' robust tenor, while Ellington gets in an Oriental kick during his driving blues "Chico Cuadradino" (jointly written with his son Mercer). Ellington is in a jaunty mood in his bossa nova "Eque," which spotlights both Johnny Hodges and Gonsalves. The infectious "Latin American Sunshine" is buoyed by Harry Carney's sonorous baritone sax and trombonist Lawrence Brown's solo. It's a shame that Ellington chose not to keep any of these originals in his repertoire once work was completed on this album.